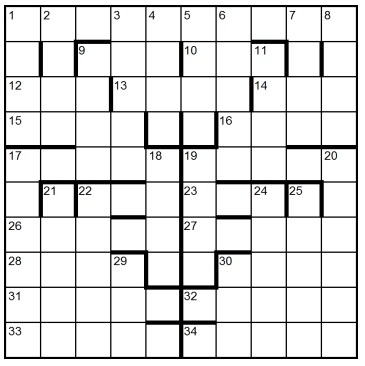 Apart from 1 and 13 Across which are normal, every clue is really two clues, separated by an extra word, leading to two symmetrically placed answers; either answer may be clued first. In clue order, the initial letters of extra words provide a hint to the theme. One jeopardy (8 contiguous cells along an appropriate path) must be moved thematically towards the other (6 cells in a line), leaving empty cells, replacing the contents of others and, ignoring spaces, always forming real words. Solvers must highlight the full name of the theme’s author (a total of thirteen cells). To enter this competition, send your entry as an image or in list format indicating the highlighted cells, to ccpuzzles@talktalk.net before the 8th February 2016.The first correct entry drawn from the hat will receive a book from the Chambers range which has been donated by Chambers.